The first round in Ukraine’s presidential election has ended in victory for the populist candidate Volodymyr Zelenskiy, an actor and comedian whose sensational ascent was the bombshell of the campaign. He will now face off in the second round against the incumbent, President Petro Poroshenko, who managed to see off competition from former prime minister Yulia Tymoshenko. The clash between the new populism of Zelenskiy, who staked everything on Ukraine’s Russian-speaking southeast, and Poroshenko’s national-patriotic conservatism is leading to a partial resumption of the old standoff between the two Ukraines, which in the current post-Crimea conditions will not lead to anything good. The period until the runoff on April 21 will therefore be a time of coalition and behind-the-scenes negotiations. 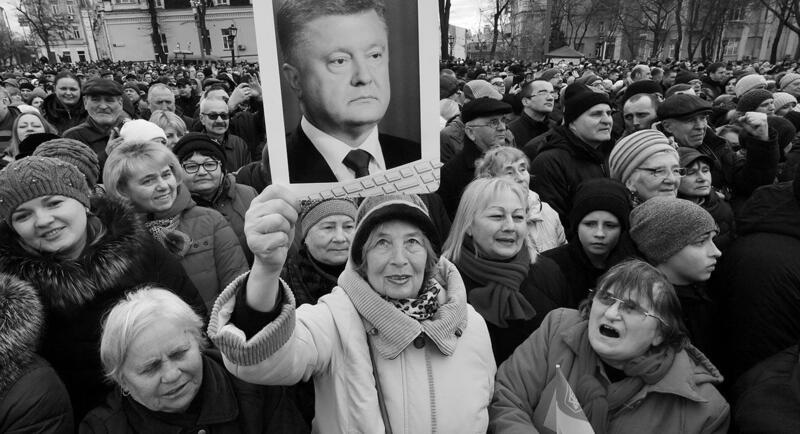 Poroshenko became president in 2014, when a significant portion of the Ukrainian elite and society coalesced following the annexation of Crimea by Russia and the Maidan uprising in Kiev that led to the ousting of President Viktor Yanukovych. Poroshenko’s mission was to stop the disintegration of Ukraine, organize its defense, and use the energy that fueled the Maidan revolution to carry out reforms. However, this consensus soon collapsed into warring factions. The situation was complicated by the military conflict raging in Ukraine’s Donbas region and the ensuing flow of refugees from the war zone. Poroshenko’s failings—the constant reforms have not brought about tangible change—were bound to prompt a wave of anti-establishment populism. Tymoshenko tried unsuccessfully to harness that wave, as did her presidential rival Anatoliy Hrytsenko, but ultimately it was Zelenskiy who rose up on its crest. In addition to his image as the “against all” candidate, he tried to represent the interests of those living in Ukraine’s southeast, Russian-speakers who are loyal to Ukraine’s integrity and independence, but tired of Poroshenko’s militancy. This task was made easier by the schism in the Opposition Bloc political party, which was unable to produce a united pro-Russian candidate capable of inheriting supporters from the largely defunct Party of Regions associated with Yanukovych. The next part of the campaign won’t be easy for Zelenskiy. He should now be able to count on getting the support of those who voted for Tymoshenko first time around (in central Ukraine and Kiev) and for Hrytsenko (in the west). Yet he remains a figure in a vacuum, a politician about whose team little is known. Before the second vote, there will be immense pressure on Zelenskiy from various influence groups to enter into an alliance with Tymoshenko or to concede the election to Poroshenko. Such an agreement, however, would mean political death for Zelenskiy, and the end of his career, and he knows this perfectly well. His main weapon is to continue to fight against the establishment, appeal directly to the people, and turn his lack of experience into his advantage, contrasting it with the intrigue and corruption associated with experienced politicians. Meanwhile, President Poroshenko can be pleased with his showing in the first round. Back in autumn 2018, it seemed he was a deeply unpopular lame duck, with no chance of getting reelected. Poroshenko took a big risk late last year by declaring martial law, which was condemned by some as hypocrisy: the authorities had waited until elections were looming to officially acknowledge that they were involved in a military conflict with Russia. Strategically, however, he picked just the right tone: that of a model patriot and supreme commander. Tymoshenko and her allies, who had incessantly accused Poroshenko of “doing blood-soaked business” in his dealings with Russia, were sidelined and stopped being perceived as an alternative to him. In the first round, Poroshenko won support in western Ukraine, above all in the symbolically important Galicia (the Lviv, Ivano-Frankivsk, and Ternopil regions), which plays an equally legitimizing role for politicians who position themselves as patriots as success in the Donbas does for a pro-Russian politician. Votes for Poroshenko were primarily a way of showing support for the path of breaking off relations with Russia, and moving closer to Europe and North America. Galicia was never entirely Sovietized and preserved its connections with Europe. Ukraine’s independence is seen there as emancipation from temporary occupation, and an act of decolonization. How this national nucleus votes mobilizes all of western and central Ukraine, which gives Poroshenko a good head start in the second round. 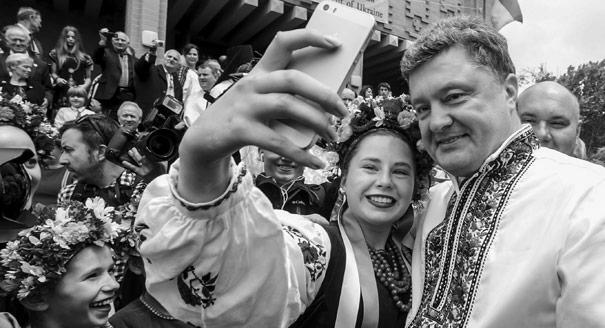 Paradoxically, Poroshenko has managed to recreate a mirror image of Russian propaganda on Ukrainian soil. The Kremlin isn’t really waging a war against Ukraine, or even against Poroshenko, who for the Russia media machine is no more than a weak-willed, comic puppet of the real enemy: the collective West. Yet Poroshenko is adamant that in these elections, his real enemy is Russian President Vladimir Putin, while his opponents inside Ukraine are either involuntary or ill-advised henchmen of that enemy. In this worldview, Poroshenko is the only guarantor that the Ukrainian army will be strengthened, and the international initiator of an anti-Russian coalition. Zelenskiy, with his nebulous reform ideas that risk becoming just another stage of the permanent transition period Ukraine has been in for the last few years, will have to face not only the full power of the presidential apparatus in the second round (it goes without saying that Poroshenko has the support of the generals and the Ukrainian security services), but also the logic of a geopolitical standoff in which Poroshenko and his politics are firmly embedded. Tymoshenko’s defeat in the first round by no means signifies the end of her political career. On the contrary, it opens up new opportunities for her. She failed to turn central Ukraine and Kiev into her support base, but the number of votes she won (essentially votes against Poroshenko) provide her with a decent negotiating position in talks with Zelenskiy. The former prime minister has an important partner in the government: Interior Affairs Minister Arsen Avakov, who has the support of the security services, including the Azov paramilitary groupings. His position will be an important bargaining chip in the backstage negotiations. In their favored scenario, the outcome of the presidential and parliamentary elections in 2019 should be a strong prime minister based on a broad coalition, under a weak President Zelenskiy. At the same time, the demoralizing effect of her defeat on Tymoshenko herself should not be underestimated. This is now the third campaign in which she has been one step away from the country’s power in its entirety. Yet another defeat—especially if she contests the results too fiercely—could make Tymoshenko a toxic figure, and the oligarchic clans may prefer to switch to Plan B: for example, trying to persuade Zelenskiy to enter into a compromise with Poroshenko, or putting their bets on Zelenskiy himself, who will after all be forced to seek support from influential figures in order to enact any kind of meaningful policies. Then there are the heirs of the Party of Regions, who will be out for revenge at the parliamentary elections this fall. The leader of the opposition platform, former energy minister Yuriy Boyko, having no chance of getting through to the second round, essentially led a parliamentary campaign overseen by Putin associate Viktor Medvedchuk, who aspires to the role of the creator of a broad coalition following a transition to a parliamentary republic, and also probably to that of parliamentary speaker. After a series of painful setbacks (his temporary marginalization following the departure from power of his patron, former Ukrainian president Leonid Kuchma, and his ill-fated backing of Tymoshenko against Yanukovych in 2010), Medvedchuk has returned to politics in good form: he has managed to split the heterogeneous Opposition Bloc and—using his connections in Moscow—strengthen the position of his protégé Boyko as the official pro-Russia candidate. That status, as Boyko’s victory in the Donbas and his second placing overall in eastern Ukraine has shown, is still a crucial indicator for former Party of Regions voters. At the same time, Medvedchuk remains an unofficial intermediary between the Kremlin and Poroshenko. He will try to sell his political capital at a good price no matter how events develop: after all, even a President Zelenskiy might need the services of a friend of Putin’s. This is all the more likely given that official Moscow itself is taking a break from events in Ukraine, and is staying out of the fray until the results of the elections are known. It has its reasons for suspecting that the elections will only add to the chaos in Ukraine. 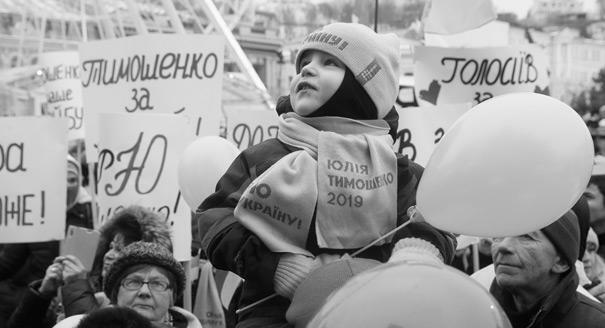 2019 will be an endurance test of Ukrainian democracy, and of the judgment of its elites.